As Till wrote recently, our national flagship climate model (UKESM1, the UK Earth System Model) has been officially released for the community to use, after more than six years in development by a team drawn from across the NERC research centres and the Met Office. The most unique capability of the UKESM effort isn’t included in that release however: UKESM1 can also be made to interactively simulate the evolution of the massive ice sheets of Greenland and Antarctica. On millennial timescales, the growth and decay of ice sheets play one of the most fundamental roles in determining the climate of the Earth – think of the ice-age cycles of the last million years. But ice sheets aren’t just for the paleoclimate people. Loss of mass from ice sheets accounts for around a third of the currently observed global mean sea level rise and their contribution is expected to increase and dominate the sea level budget in the coming decades and centuries (Church et al. 2013). 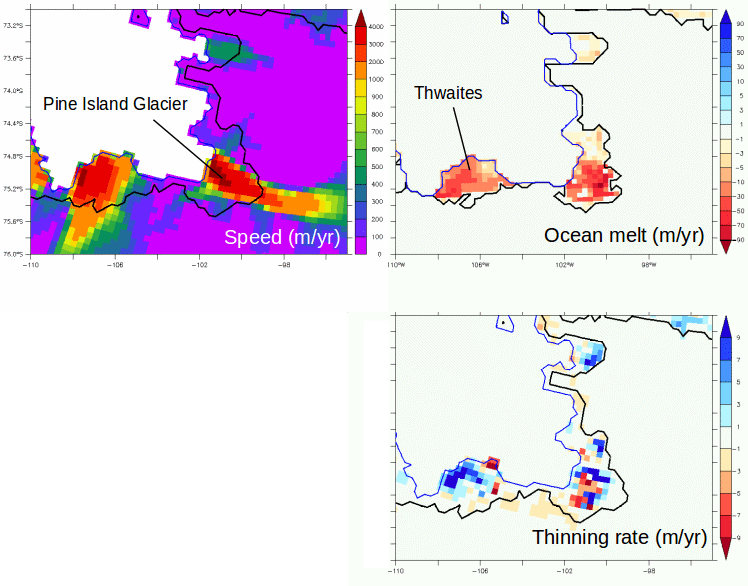 The climate change impact from ice sheets isn’t limited to sea level rise either, with ice melt input to the ocean linked to a range of wide climate change problems (Golledge et al. 2019). Back near the start of this project I wrote in this blog about plans for the ice sheets in UKESM and some of the challenges that we were facing. Since then we’ve implemented a system of online climate downscaling over ice sheets in the Met Office Unified Model, taught the NEMO (Nucleus for European Modelling of the Ocean) ocean model to move its boundaries (a little) as it runs without becoming unstable and built a whole framework of Python code to transfer fields between the BISICLES (Berkley Ice Sheet Initiative for Climate Extremes) ice sheet model and the rest of the climate system. The whole system adds additional layers of complexity to what is already one of the most sophisticated climate models in the world. It’s all still a bit rough around the edges, which is why this isn’t included in the main UKESM1 release, but there is finally a functioning coupled climate-ice model that can do things that no other state of the art climate model can do. 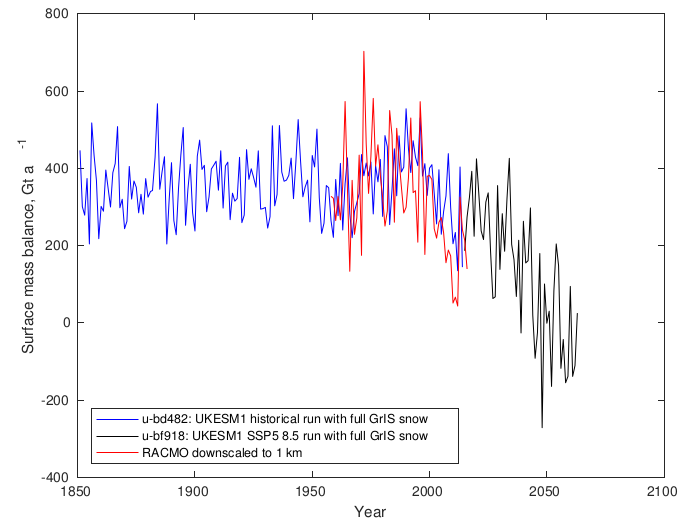 Figure 1: Surface Mass Balance (SMB) (the balance between accumulating and melting snow) estimated for Greenland in UKESM (blue and black lines) compared with the output from a specialised regional climate model (red line, Noel et al. 2018). UKESM captures the observed downturn in SMB at the end of the 1990s, often linked with decadal variability in the North Atlantic. The coupled ice sheet component additionally models the dynamic flow and calving rate of the ice sheet to give a complete estimate of how the ice mass will evolve. So, has it all been worth it? What are we going to do with this model now we’ve made it? Whilst there are many open questions around the stability of the large ice sheets and how they interact with the climate around them, our first goal will be completion of a set of coupled climate—ice simulations for the Ice Sheet Model Intercomparison ISMIP6, an international model intercomparison that will provide projections of 21st century ice sheet mass loss. Early results from UKESM with our new online downscaling for the ice compare very well to regional climate model results (Figure 1) and suggest that additional surface melt of Greenland alone could be adding another millimetre to global-mean sea level every year by 2050. Figure 2: Pine Island Glacier on Antarctica is observed to be thinning and retreating rapidly, most likely in response to ocean warming underneath its ice shelf. With the interactive ice in UKESM we can model how the ocean melts the shelf away (top right), the flow of the glacier supplying new ice to the region (top left) and predict the overall rate of retreat. These are early results but show promise. The most exciting new science we want to tackle with the ice in UKESM1 sits at the other end of the globe, however. There are many theories about how the floating ice shelves that fringe Antarctica respond to changes in ocean conditions, and how the flow of the grounded ice upstream will respond, but the uncertainties are enormous. Estimates of the resulting contribution to global mean sea level rise at 2100 range from centimetres to metres (see Edwards et al. 2019 for a recent perspective). This is an inherently coupled problem whose physics simply cannot be understood by modelling any one part of the system in isolation. Like all complex problems, it’s also going to be very hard – there are poorly-observed, crucial details in each component that can significantly alter the final outcomes – and we’re not pretending that one model is going to lead us straight to the answers. For one thing, there are long-standing biases in the climate simulation of the Met Office models in the high southern latitudes that will need to be improved before we are really simulating the processes against the right background. But with UKESM1 we’re now getting our hands on some tools that can start to see the coupled atmosphere-ocean-ice physics evolving together for the first time (Figure 2), and that’s a very promising development. This entry was posted in antarctica, Arctic, Climate, Climate modelling, Cryosphere, Numerical modelling. Bookmark the permalink.